Since 2000, the race to find the oldest possible human fossil has been intense. Several new finds have been announced that have pushed the records back from the Pliocene to the late Miocene. These early dates are of course within the range of molecular estimates for the split of humans from chimps (8-5 Myr ago), but they exceed the favoured estimate of 5 Myr ago that was derived from genetic analyses. There are two ancient contenders, both dated at about 6 Myr old and both announced in rapid succession by rival teams. The first is Orrorin tugenensis, named by Senut et al. (2001) from teeth, jaw fragments and broken limb bones from sediments in Kenya dated at about 6 Myr old. The teeth are rather ape-like, the arm bones indicate some ability to brachiate,but the femora suggest that Orrorin was an upright biped. This report proved to be controversial at once, with claims that Or-rorin was not bipedal, was an ape rather than a human, or at least that the remains were inadequate to be sure (Haile-Selassie, 2001; Cela-Conde and Ayala, 2003). erally been accepted, however, as a basal hominid (Cela-Conde and Ayala, 2003), perhaps the closest we will find to the common ancestor of chimps and humans. Less controversial is Ardipithecus ramidus from Ethiopia, dating from 4.4Myr ago (White et al., 1994) and an older species, A. kadabba,from 5.8 to 5.2 Myr ago (Haile-Selassie, 2001; Haile-Selassie et al., 2004). The younger material consists of an associated set of upper and lower teeth, bones from the forehead and lower region of two skulls, an associated humerus, radius and ulna, and other isolated teeth and bones. Ardipithecus retains relatively large canine teeth, narrow molars, thin enamel and other primitive features, but these teeth are more hominine than in any of the great apes (Figure 11.9(a)). They indicate a diet mainly of fruit and leaves. 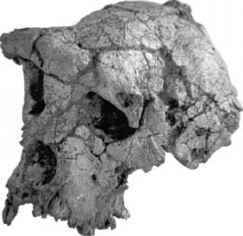 In addition, Ardipithecus has a forwardly-placed foramen magnum, cited as proof that it was a biped.